Every year when I see little green shoots poking out of the ground I become hopeful for a healthy, green summer vegetable garden in spite of past experience. 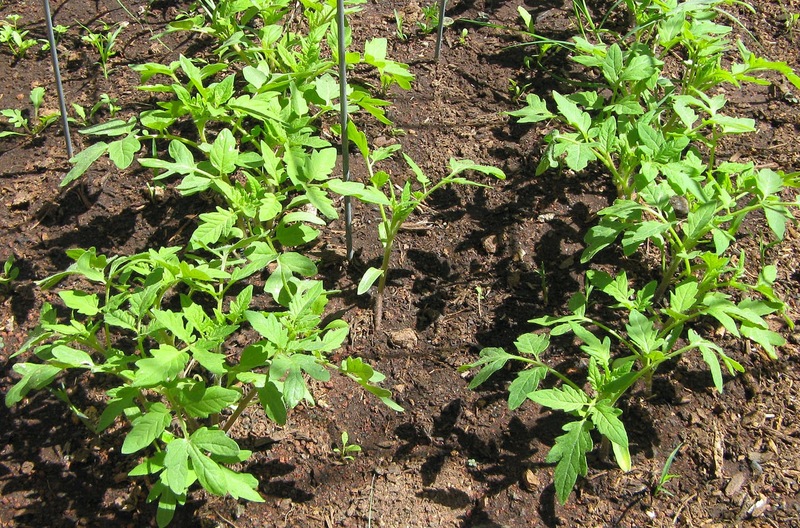 I know that in less than two months the blistering-hot sun will scorch leaves, daytime temperatures will cause chronic wilting, and all the stress will make the plants susceptible to pests and diseases. But this is such a cheerful sight! This year I decided to just empty all my old tomato seed packets (some of them 7 years old!) into one of the planters and wait and see. Obviously they are thriving in our lovely warm Spring. 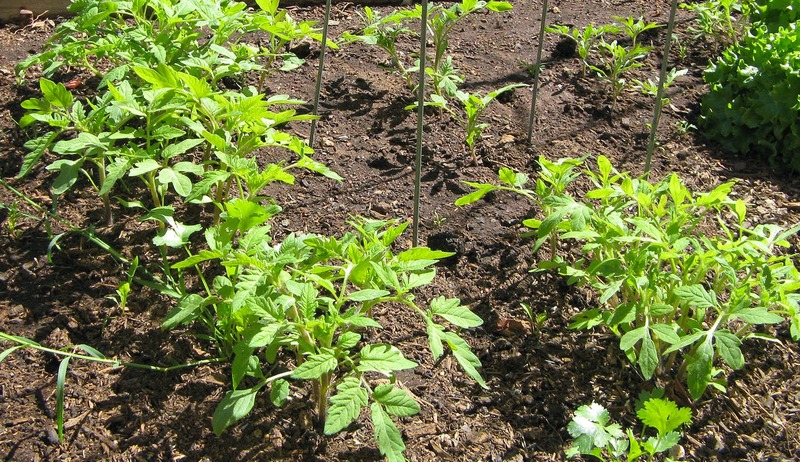 If the mild weather would last through May, we might just get a real tomato. 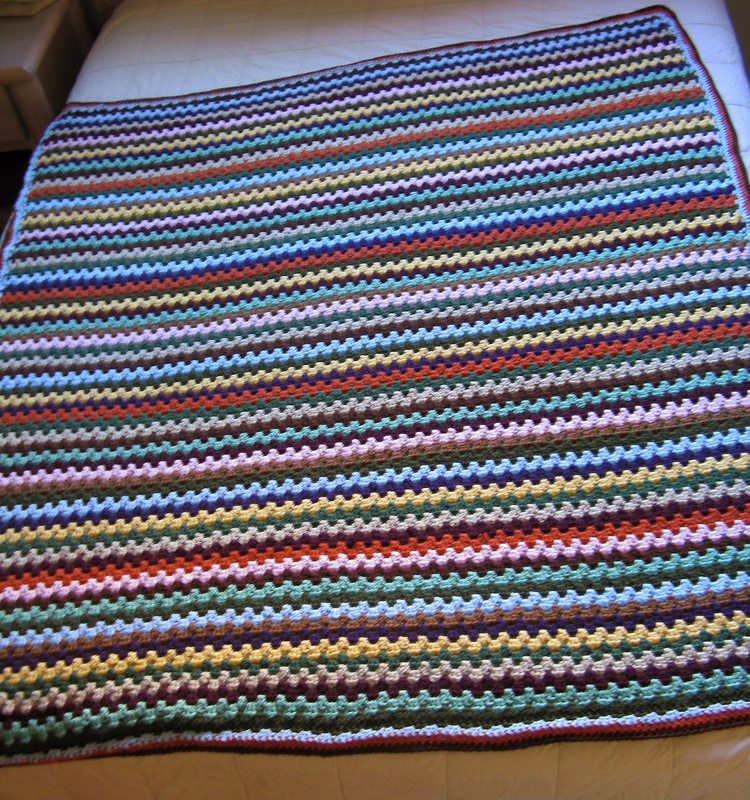 That's my estimate of how many stitches went into the Autumn Afghan. 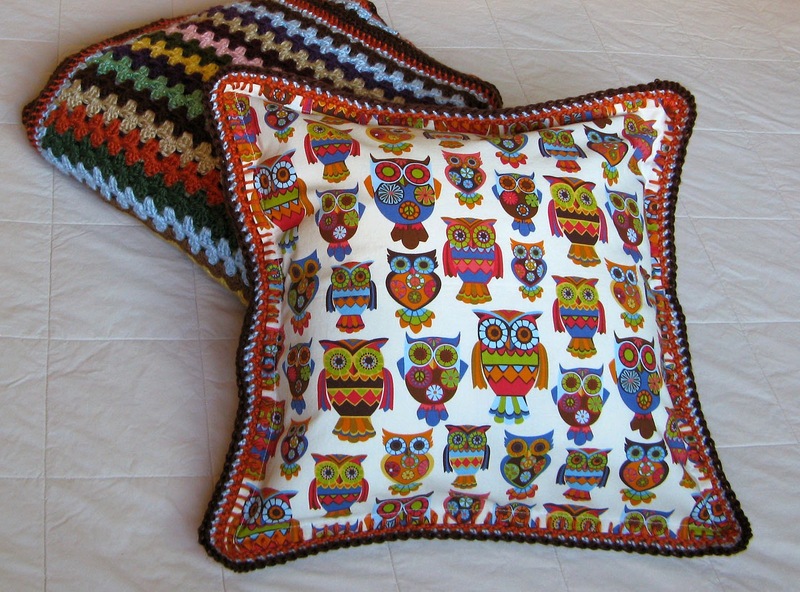 To top it off, I decided to make a pillow with this beautiful owl fabric, which was part of the inspiration for this crazy crochet color explosion to start with. I don't if there is a specific way to attach crochet to fabric, and at this point I was too tired to look it up. 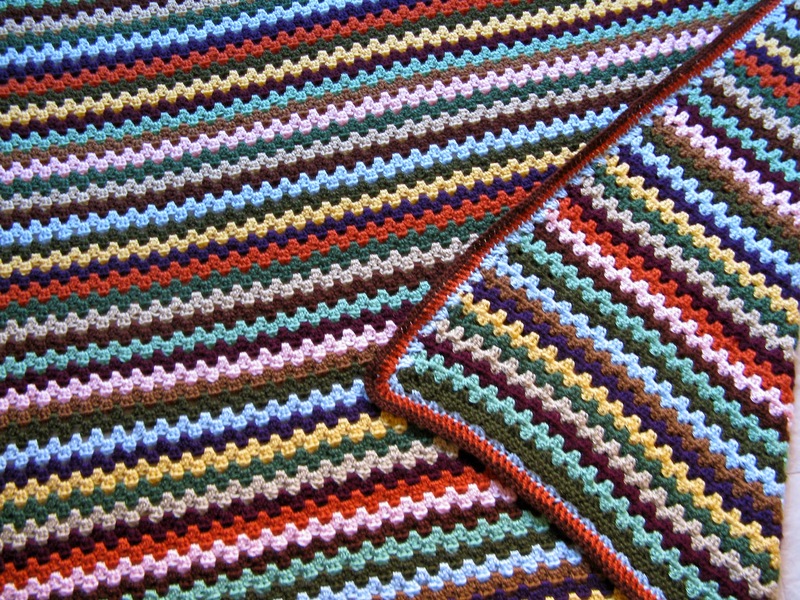 I just sewed a blanket stitch around all four sides of the pillow, and used that as my foundation to crochet the striped border. Three of my mismatched buttons and loosely chained loops hold the pillow envelope closed on the back. All ready for a nap! I am pretty amazed that I stuck with this for four months, rather than putting it away and letting it age like the rest of my UFOs. On that note, I'm going to unearth some of those poor, forgotten projects, and see if they can be salvaged. Pink is pretty far down on my list of colors for apparel and even home décor, so my having actually sewn a pink jacket seems like the perfect topic for a Valentine's Day post. 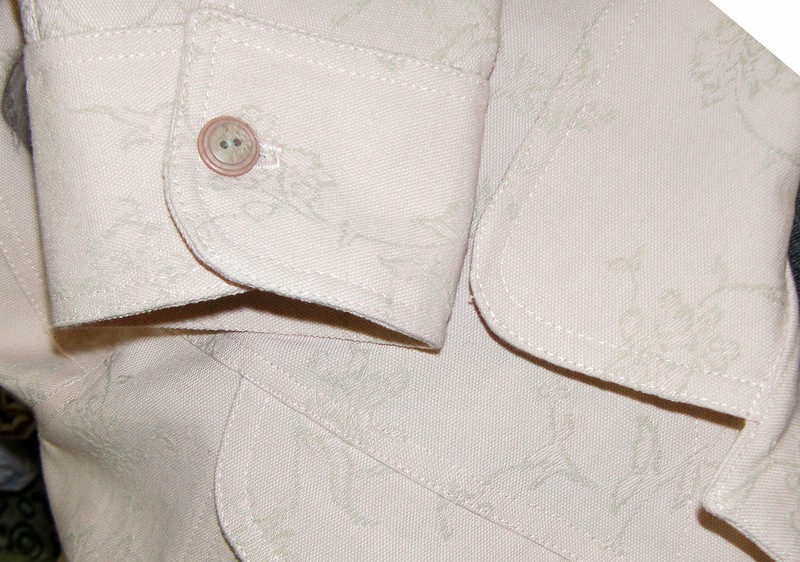 This soft denim is a very pale pink with gray (or beige, depending on the light) embroidery. It was originally intended for jeans, but having decided that I prefer darker colors on my lower half, the fabric stayed folded on the shelf until I opened up the Craftsy course Sew Better, Sew Faster. 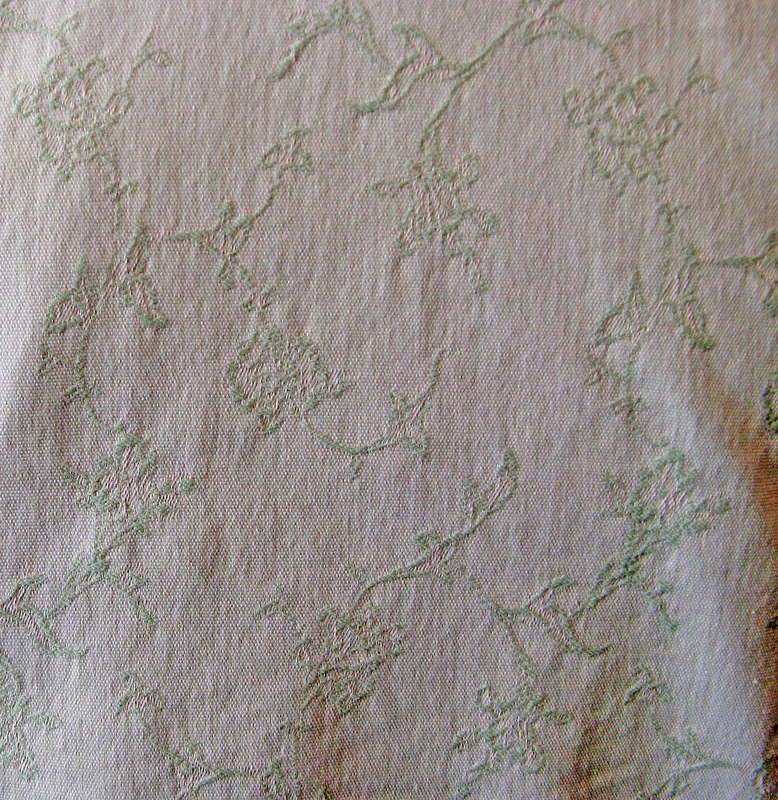 It's a project and technique course in which "garment industry secrets" are applied to sewing this Islander pattern for a modern jean jacket. 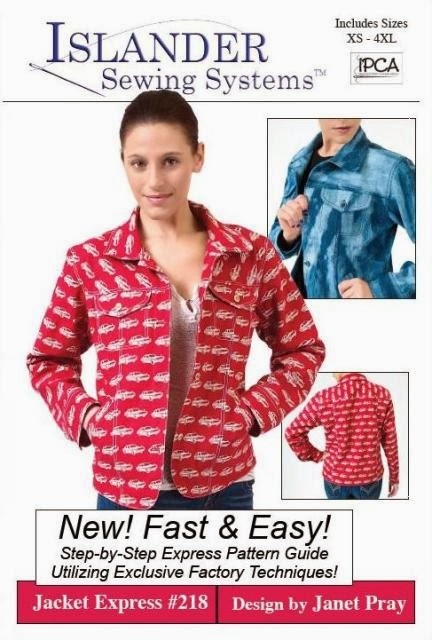 I'd actually signed up for the industry secrets, not for the jacket pattern, since the pattern photos did not look very flattering, but rather quite boxy and floppy. Still, I figured that following the instructor through the making of the jacket was the best way to learn these coveted secrets. I will start by saying that although the course did not change my sewing life, there was one clever method of turning the garment to apply a yoke facing that I am quite delighted with. Other than that, most of the "secrets" are things that anyone who has been sewing for some time will pick up automatically. For example, in the garment industry they don't pin pieces together before stitching. I think we all know that already, and I would be surprised if there is anyone, who has been sewing for a few years, who still pins every seam together. Another example of a garment industry practice is order of construction: sewing all the seams, whether for the body, sleeve, collar, before topstitching, rather than sewing and topstitching each one in turn. Doesn't this seem rather obvious? As expected, the jacket pattern was no great revelation either. For a pattern with front and back princess seams, and three (yes! three!) sleeve seams, I would expect a more fitted shape, but maybe it is meant to provide a blank canvas for people to fit to their own figures. Surprisingly, I like it. It is boxy and floppy, but it is supposed to be casual so I don't mind the looseness and droopy shoulders so much. 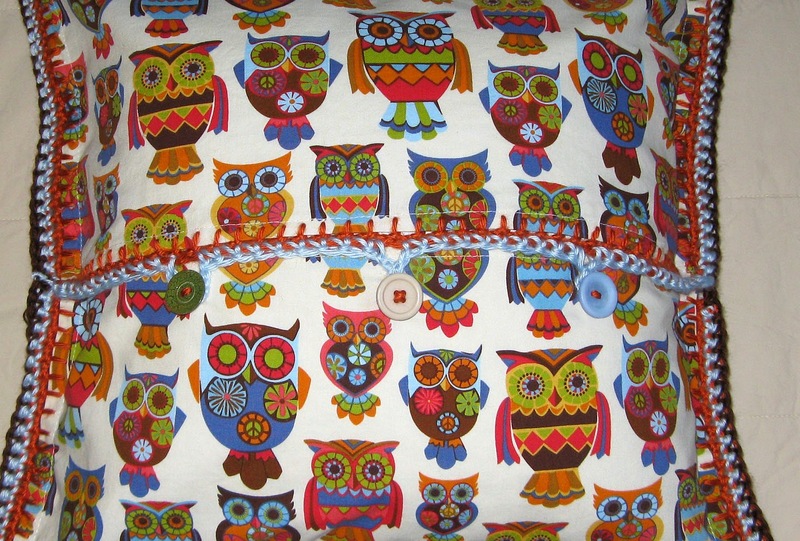 The fabric is still a favorite and after scouring four fabric stores, I finally found buttons that I think are perfect. 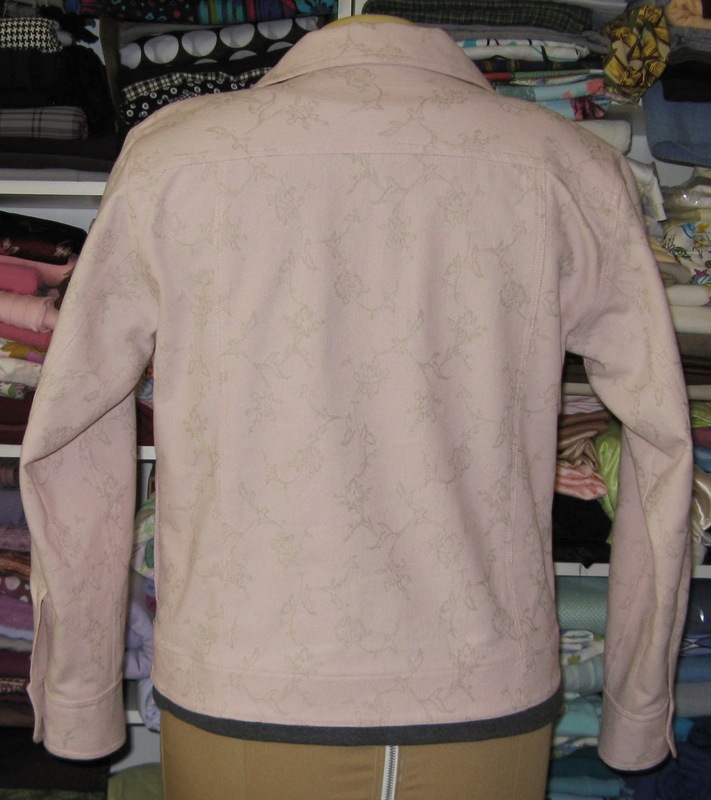 It has some nice details, like the rounded collar and cuffs. Even though I was disappointed in the course, I think this was a win overall, with a cute, casual jacket and an interesting yoke application that I can use on shirts as well. I would say this particular course is good for intermediate-beginners, that is, you know how to use your machine and have made some garments, but you haven't been sewing for so long that nothing is "secret" any longer. 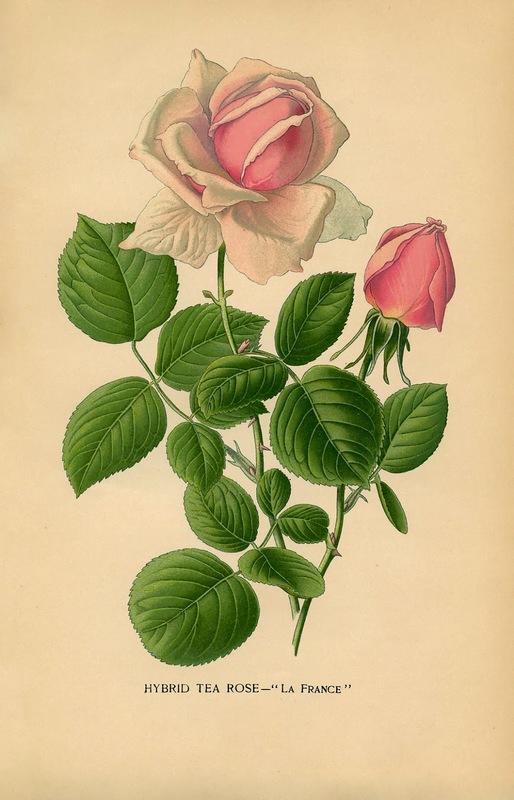 I will be watching the course again (one of the great things about Craftsy) to see if I missed any other gems. 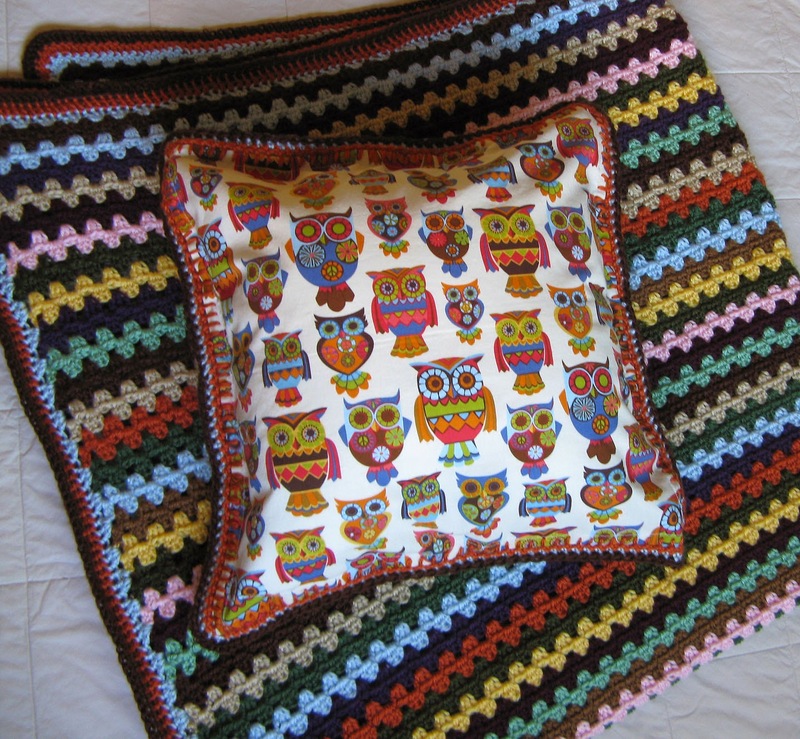 Have you taken any Craftsy courses recently? Or other online classes? Did they meet your expectations? These last few months our house has been under construction, which, as far as I can tell, consists primarily of periods of violent demolition, followed by extended periods of silence, followed by even longer periods of desperate phone calls to absent contractors. In all the chaos of tarps on the furniture, clothes in the office, pets in the bathroom, and dust absolutely everywhere, we've somehow still managed to bake. 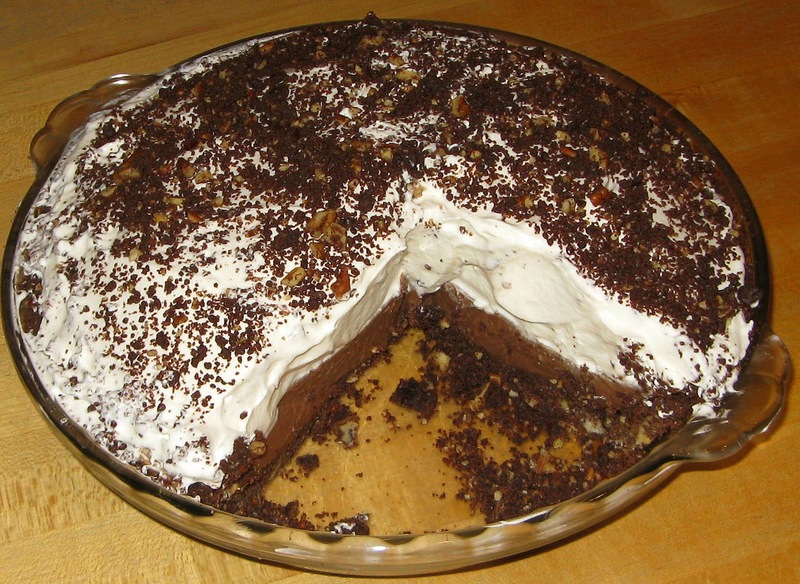 My birthday was last month (some days I feel 30, other days closer to 90, but the real number is somewhere in between), and my first confectionery request of the Piemaker was this Mocha Espresso Cream Pie. Another great recipe from Southern Living - this one was in the Thanksgiving issue! We have made a lot of chocolate pies. A LOT! But we think this is the best so far. 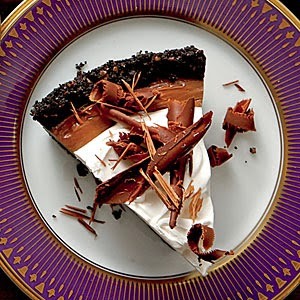 The chocolate filling is a pudding, so it is not as rich as a ganache torte nor as dense as a chocolate silk or satin pie, but it actually has more chocolate flavor, somehow. I broke my rule of not putting cream on pie, because in this case the whipped cream is flavored with Kahlua, and definitely adds more than just calories to the plate. Next, I was intrigued by the concept of the Hummingbird Cake. It's a Southern tradition with mysterious roots. If you ask 20 people who invented it or where it came from, you'll get 20 different answers. 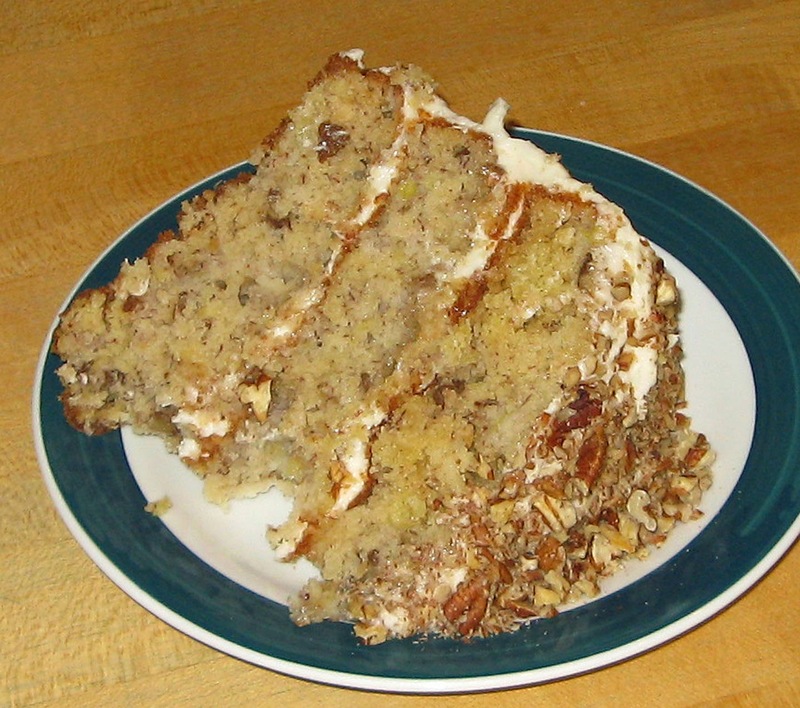 I still don't know why it is called Hummingbird Cake - it is a heavy spice cake containing bananas and pineapple. 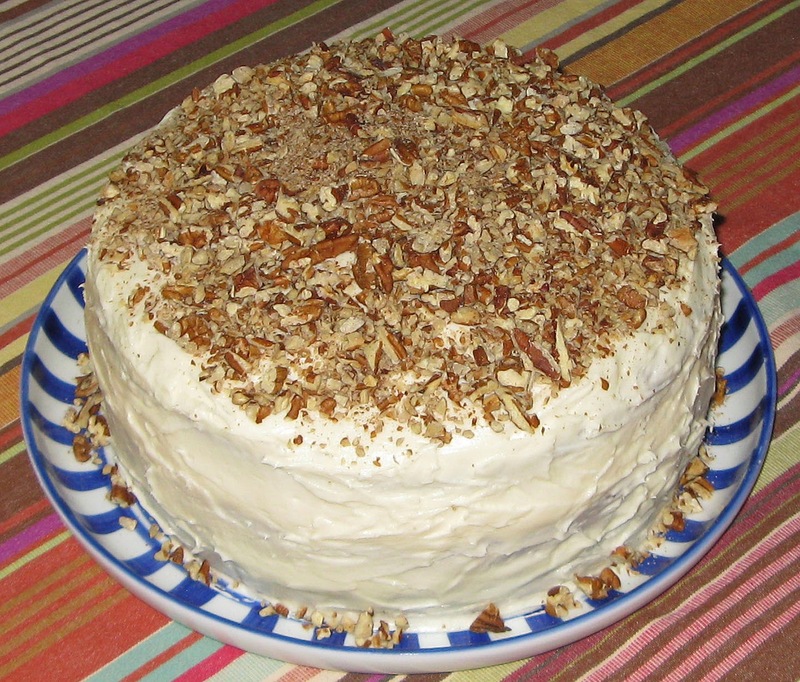 It is layered with the standard cream cheese and butter frosting. After recovering from all that overindulgence, I developed a craving for almond cakes, which seems to be an annual thing (see 2012 and 2013). My DSIL (who is highly sympathetic to my love of cakes and pies) sent me a lovely new cookbook called Bake It Like You Mean It, by Gesine Bullock-Prado. After reviewing the various almond-based recipes and the price of almond paste (!!! 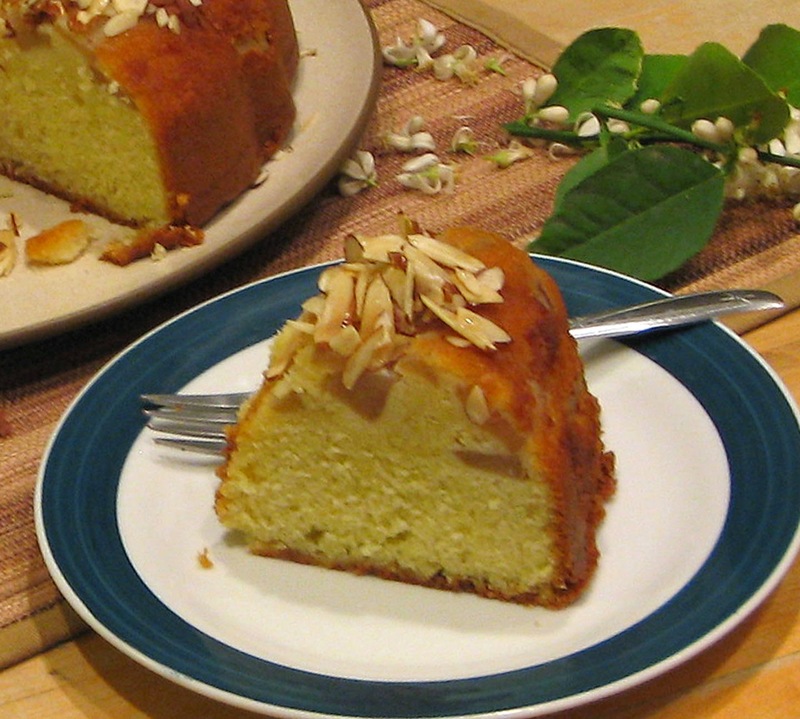 ), I decided on "The Very Best Almond-Pear Bee Sting" cake. Let's first recall that I rarely follow directions, whether for sewing, gardening, cooking, or baking. Thus, when I saw that I should poach two pears in white wine, I decided to poach them instead in a combination of water and port, rather than go to the store for wine. (In case you're wondering, port-poached-pears are DELICIOUS!) When the recipe stated that I would be making 8 mini-Bundt cakes, I ignored it and instead made one full-sized cake. 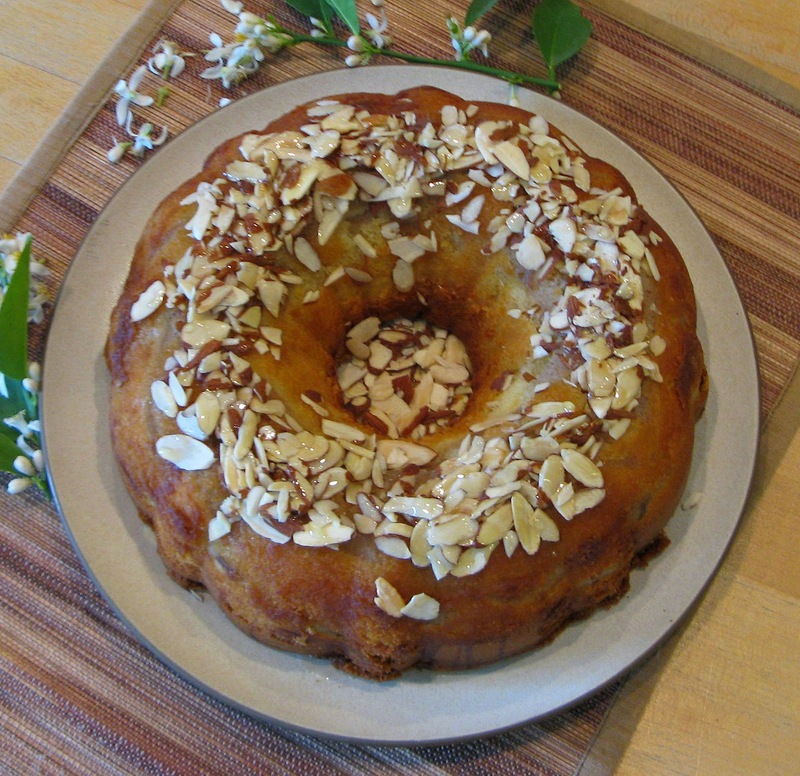 And finally, when the weight of the pears made the top of the cake fall off, and I had to patch it up, I decided to top the cake with almonds and honey rather than the smooth sugar icing called for in the recipe. So why is it called a bee sting? I think it is supposed to be because there is honey in it, but it's also interesting to note that both almonds and pears are pollinated by bees. Poach pears: Combine liquids and sugar in a saucepan, bring to a simmer. Add pear slices and simmer until tender. Remove pears to a plate and allow to cool. Bake cake: In a mixing bowl, combine almond paste and sugar and chop with knife or pastry cutter until pebble-sized. Use hand mixer or stand mixer to beat mixture at medium speed until almond paste is smooth. Add butter, honey, and extracts and beat until light and fluffy. Add eggs one at a time, beating thoroughly and scraping down sides of bowl. Sift together flour, salt and baking powder in a bowl. Slowly add flour mixture to cake batter and beat just until well combined. Lightly butter or oil a Bundt cake pan. Pour ½ of the batter into the pan. Place the pear slices into the batter. Add the remaining cake batter. Bake at 325 degrees for 50 to 55 minutes, until golden brown. Allow cake to cool for 30-40 minutes, enough to loosen slightly from the sides, before inverting onto a plate. Top it: Warm the honey slightly so it pours easily. Drizzle a small amount on the top of the cake to help the almonds adhere. Sprinkle the almonds over the top, pat gently if necessary. Pour the remaining honey over the almonds and cake. At least we have no shortage of calories to get us through the construction chaos. Have you discovered any good recipes recently? 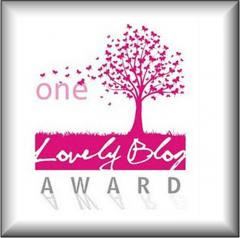 Prolific but unpublished author. 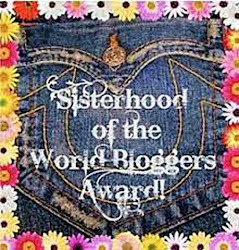 Between the surges of writing, I read, sew, work in my vegetable garden, and dabble in mixed-media art. I love old things and shopping at second-hand shops, and I am starting to get used to the idea that "vintage" is now used to describe things that are younger than me.